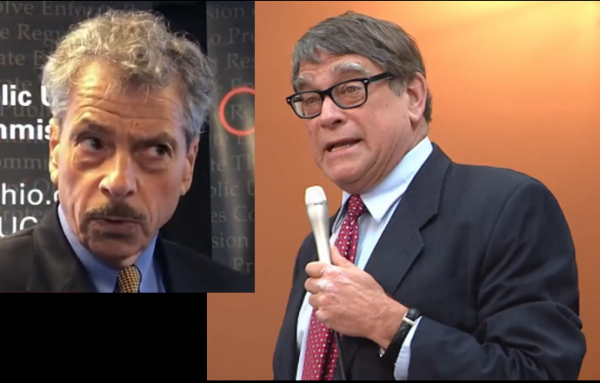 Newly-uncovered emails show the strong sway a lobbyist for large industrial users of coal power has had on Ohio wind-energy foe Rep. Bill Seitz’s efforts to keep the state’s strict property line setbacks in place. Insights from the 2017 emails are especially timely as a coalition of business, environmental and other groups work to bring growth back to the state’s wind industry by dialing back the restrictions put in place four years ago. Former Speaker Rosenberger’s role also raises questions. In the early morning hours of June 27, 2017, a House-Senate Conference Committee worked to come up with a final budget to send to Ohio Gov. John Kasich. Senate President Larry Obhof was struggling nearby with Speaker Cliff Rosenberger. At issue was an amendment to replace restrictive language that had appeared anonymously in the 2014 budget bill and tripled the distance a wind turbine could be erected from adjacent properties. That set-back restriction has devastated development of the wind industry in Ohio. Rosenberger, Ohio-state chairman of the American Legislative Exchange Council (ALEC), appears to have been armed with a detailed critique of the amendment provided to him by Rep. Bill Seitz, a member of ALEC’s board of governors, and written by a powerful lobbyist known as “The Randazzler” — Sam Randazzo of the firm McNess Wallace & Nurick LLC. Since January, we’ve been examining how self-proclaimed “free market” Bill Seitz, now Majority Leader in Ohio’s House of Representatives, has picked energy winners and losers in the Ohio economy. Seitz has aggressively worked for a ratepayer bailout of uncompetitive Ohio coal plants, while blocking the growth of the wind industry and thousands of Ohio jobs. Emails obtained by the Checks and Balances Project show the extent to which Seitz’s efforts were guided by Randazzo. 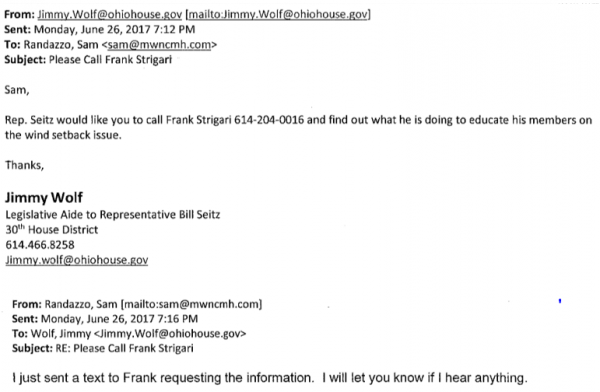 Six days before the conference committee negotiations began, Seitz’s Legislative Aide at the time, Jimmy Wolf, sent an email to Randazzo. An amendment to the Senate budget bill had just been introduced that would modify the current setback restrictions and Seitz needed Randazzo’s help. An hour and two minutes later, Randazzo responded to Wolf by email with a detailed critique of the amendment to fix the wind setback. Five days later — the day before the House-Senate budget conference was to begin — Seitz had a new task for Randazzo. Although he had finished two, four-year terms in the Ohio Senate the year before, his relations with Senate President Obhof and others in that body were not good. But he needed to know how strong the opposition was among Senate members of the conference committee to his anti-wind crusade. So, he sent Randazzo to gather intelligence from the Ohio Senate’s Chief Legal Counsel Frank Strigari. The next day, the conference committee began. Typically, the conference committee, chaired by the Senate and House finance chairs and comprised of six members, meets only twice publicly — at the beginning and at the end. Meanwhile, Speaker Rosenberger and Senate President Obhof met privately to negotiate the more difficult issues. When the conference finally ended at 3 a.m., Rosenberger had prevailed. The amendment had been withdrawn. The next day, Seitz emailed Randazzo. “Like the Boy Scouts say,” he wrote. “Be Prepared.” They were victorious. More than $4.2 billion in new wind farm investment was still on hold.